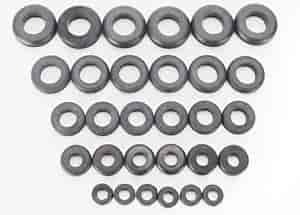 Moroso 39050 - Firewall Grommet Assortment Outside Dimensions: 1/2" to 1"
Features an extra thick wall section to insulate and protect wires, cables and hoses from sharp edges. Includes six of each hole size; 1/2'', 5/8'', 3/4'', 7/8'' & 1''. 30/pkg.